Another superb episode of Who, with top notch effects and a fine cast. The Krillitanes made for a fine foe, fronted by the sneering Headmaster Lucas Finch (played by Anthony Head). A malevolent alien species that advance and evolve through their voracious hunger – that present all sorts of possibilities. I daresay they would make a great villain, fleshed out and beefed up, in a tabletop campaign of Doctor Who: Adventures in Time & Space. Seeing Sarah Jane Smith and K-9 again obviously made this a stand-out episode for any fan… but, they didn’t appear simply for the novelty value. Telling the tale of a companion post-TARDIS filled out a little of the Who mythos, giving a very emotive view of how a suddenly very ordinary world can become a prison to one of the Doctor’s ex-associates. Can The Doctor be entirely ignorant of the impact he has on those he travels with? Considering the continual wonder he seems to chase in his adventures across the universe, could the Last of the Time Lords really be so naive as to imagine his companion might feel a little of the same? It’s a subject authors have touched upon in the books, notably with respect to the Eighth Doctor and his companion Sam, but never really in the TV series before. We’ve heard many companions begging for the Doctor to take them home, but none lamenting the grey ordinariness of the world upon their return. 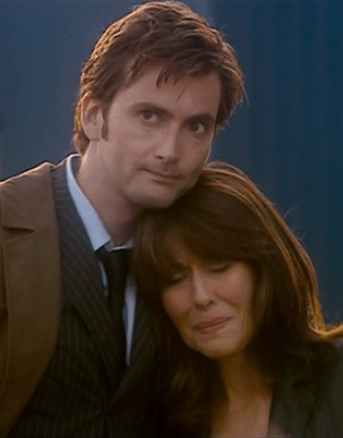 This entry was posted in General, Tenth Doctor and tagged Anthony Head, Doctor Who, Sarah Jane Smith, School Reunion, TARDIS on May 2, 2006 by Paul B.